Philosophy written in Arabic and in the Islamic world represents one of the great traditions of Western philosophy. Inspired by Greek philosophical works and the indigenous ideas of Islamic theology, Arabic philosophers from the ninth century onwards put forward ideas of great philosophical and historical importance. This collection of essays, by some of the leading scholars in Arabic philosophy, provides an introduction to the field by way of chapters devoted to individual thinkers (such as al-Farabi, Avicenna and Averroes) or groups, especially during the 'classical' period from the ninth to the twelfth centuries. It also includes chapters on areas of philosophical inquiry across the tradition, such as ethics and metaphysics. Finally, it includes chapters on later Islamic thought, and on the connections between Arabic philosophy and Greek, Jewish, and Latin philosophy. The volume also includes a useful bibliography and a chronology of the most important Arabic thinkers. 1. Introduction Peter Adamson and Richard C. Taylor; 2. Greek into Arabic: neoplatonism in translation Cristina D'Ancona; 3. Al-Kindi and the reception of Greek philosophy Peter Adamson; 4. Al-Farabi and the philosophical curriculum David Reisman; 5. The Isma'ilis Paul Walker; 6. Avicenna and the Avicennian tradition Robert Wisnovsky; 7. Al-Gazali Michael E. Marmura; 8. Philosophy in Andalusia: Ibn Bajja and Ibn Tufayl Josep Puig Montada; 9. Averroes: religious dialectic and Aristotelian philosophical thought Richard C. Taylor; 10. Suhrawardi and illuminationism John Walbridge; 11. Mysticism and philosophy: Obn 'Arabi and Mulla Sadra Sajjad H. Rizvi; 12. Logic Tony Street; 13. Ethical and political philosophy Charles E. Butterworth; 14. Natural philosophy Marwan Rashed; 15. Psychology: soul and intellect Deborah L. Black; 16. Metaphysics Therese-Anne Druart; 17. Islamic philosophy and Jewish philosophy Steven Harvey; 18. Arabic into Latin: the reception of Arabic philosophy into Western Europe Charles Burnett; 19. Recent trends in Arabic and Persian philosophy Hossein Ziai. 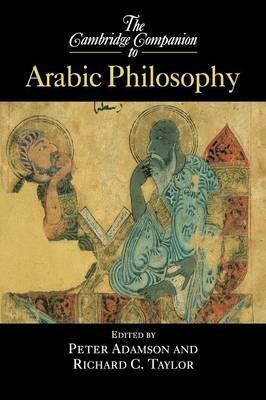 'The Cambridge Companion to Arabic Philosophy was long overdue. The Arabic philosophical tradition has often been treated as marginal by Western scholars, but this work attests to its great riches. It has, however, remained much understudied, hence, the editors aim to 'invite' readers to the study of Arabic philosophy and to provide 'a basic grounding in some of the main figures and themes'. These are modest goals in comparison to what this excellent new Cambridge Companion achieves. ... The Cambridge Companion to Arabic Philosophy will not only be of interest to scholars and students of Arabic philosophy, but should also be of interest to students and scholars working more generally on later Greek philosophical traditions and on philosophy in the Middle Ages. The work should remain a very good reference for a number of years to come.' Bryn Mawr Classical Review 'By any reckoning this is a remarkable book.' Reference Reviews '... a rich and up-to-date assessment of the varied philosophy written in Arabic - including Christian and Jewish as well as Muslim thinkers ...' The Heythrop Journal '... a precious depository of scholarship and an indispensable tool for anyone who wants to acquire a comprehensive view of Arabic philosophy, or gain a deeper appreciation of its different authors and parts. From it, the reader facing Arabic philosophy for the first time will get a basic orientation in this important area of culture, the student will acquire updated, competent and enlightening information, and the researcher will find a sure and clear guide to the intricacies of the field.' International Journal of the Classical Tradition "In short, The Cambridge Companion to Arabic Philosophy will not only be of interest to scholars and students of Arabic philosophy, but should also be of interest to students and scholars working more generally on later Greek philosophical traditions and on philosophy in the Middle Ages. The work should remain a very good reference for a number of years to come." --Roxanne D. Marcotte, The University of Queensland "...Out of eighteen contributions to this Companion ten are in general terms historical in nature, four systematic dealing with logic, ethics, philosophical psychology, and metaphysics.... gives an account of interesting collaborative encounter between Islamic and Jewish Philosophy...."
Peter Adamson is Lecturer in Philosophy at King's College London. Richard C. Taylor is Associate Professor of Philosophy at Marquette University.